When I found out that I was pregnant with our Rainbow Baby (lovingly nicknamed Pumpkin throughout my pregnancy) I knew I wanted to try a different pain management method for my natural birth. Determined to stay out of a hospital and to have a 3rd successful natural birth, I finally settled on Hypnobabies. Because I have two toddlers, taking a Hypnobabies class in person was out of the question. Instead, I did this home study course and LOVED it. In my previous two deliveries, I struggled with some fear and anxiety. Anxiety is actually a pretty common presence in my life, and I loved that Hypnobabies allowed me to practice calming techniques for weeks leading up to the delivery. It also taught me some awesome affirmations that I used throughout my 3rd labor which ended up being an extremely fast whirlwind delivery. If you’re interested in how that all played out (in just TWO HOURS), keep reading to hear our beautiful daughter’s birth story! On April 8th, I stayed up late working on this blog and chatting with Carly at Mommy on Purpose. I was getting frustrated with our internet and how slow everything was moving, so even though I decided I’d stay up til 3 am working, I went to bed around 2 and fell asleep somewhere around 2:30. A little before 4:30 am, I woke up to go to the bathroom. While I was sitting on the toilet I felt a sharp pain in my cervix. Very shortly after, I had two contractions really close together. I started timing the first one at 4:34 am. The next contraction came 4 minutes later. The next one just 2 minutes later. I woke my husband up by hitting his leg and told him he needed to get out of bed, that I was having contractions. I immediately went into the bathroom and hopped in the shower while he sat on the toilet with my phone timing my contractions. He called the birth center and told the answering service my information so the midwife on call could call me back. He also text our awesome friend Becky that I was having strong contractions and to let us know when they were awake. He text her at 4:46 am…which ended up being *perfect* timing. More on that later. By the time the midwife on call, Laura called me, I was standing in front of the mirror in our bathroom wondering if I had time to dry my hair. I told her my contractions were between 2 and 3 minutes apart. She said I needed to leave right away to get to the birth center. I’ll never forget the look on my oldest son’s face when I walked out of the bathroom. My husband had woken our boys up by dragging them out of bed by their feet and telling them we needed to hurry and get dressed because mommy was having the baby. Nugget was just standing there holding his “Pandy” teddy bear with this huge grin on his face. Knees together, standing tall, just so excited to be wide awake before 5 am with pandemonium all around him. This time, I remembered to take a picture with both of my sons right before we left the house. It was one of my biggest regrets after having my second son. I didn’t take a picture with my oldest son in his last moments as an only child. At 5:12 I text her that my last 2 contractions were a minute apart and that the boys might have to be there when I have the baby. That’s when she offered to meet us at the birth center. She left immediately and beat us there. She went inside to make sure someone was there and everything. If I hand scripted a friend for my labors, I couldn’t do better than Becky. Seriously. She’s just freaking awesome. Hypnobabies was in the back of my mind through all of this craziness. I knew I needed to be doing my affirmations and focusing on my birth waves and creating my bubble of peace. It was incredibly difficult to even think about doing hypnosis with all of the rushing going on. I was prepared though. When I was about to get in the car and told my husband I really wanted my hypnobabies CDs to take with us. He looked at me like I was crazy, but I took off running back into the house and upstairs to get them before he could say much. While we were in the car, I was trying to practice my hypnobabies techniques. I was so stressed that I can say for 100% certain I didn’t get to a hypnotic state because I was too worried I wouldn’t make it to the birth center and would have the baby on the side of the road. When we got to the birth center, Jessica was there waiting. She was on the first floor in the delivery suites and not upstairs where they see patients. That’s why Becky hadn’t seen anyone. I walked in and gave Becky a huge hug and walked into the delivery suite, then said I wanted to go say goodbye to my boys and ran back outside and hugged them both so tight. It breaks my heart to leave them ever. Jessica checked my progress and said it was a really weird exam because my bag was bulging. She guessed I was about 6 cm dialated. She asked if I wanted to get in the tub and I immediately said yes. I asked her if she could make it as hot as possible. Unfortunately, I love REALLY hot baths, and that kind of hot isn’t safe for baby, so the water is basically luke warm to me. It does nothing for my pain management like other moms swear by. I breathed though a few strong contractions while Scotty rubbed my back vigorously to help through back labor. I’ve read that women with short torsos are just doomed to have back labor. So far, I’m 3 for 3. I believe them. Finally the contractions were getting pretty strong and I was really uncomfortable. I asked Jessica to check me again. She said well I said you were 6 cm and now you’re more like 9 or 9 and a half. She asked me to let her know when I felt the urge to push so she could get the nurse in the room. With the next contraction I yelled to her that I was pushing and she yelled for the nurse to come in. I was leaning over the side of the tub so Scotty could rub my back, but Jessica said I needed to either flip on my back or get out of the tub because the position I was in wasn’t safe for delivering baby. I said well I can’t, the pain in my back is too bad, let’s get on the bed. It was EXACTLY the same scerio as our 2nd baby Tinson. I couldn’t imagine laying on my back and giving up Scotty’s back rubbing, so I delivered Tinson on hands and knees in bed. Cut to almost exactly 22 months later and here we were in the same situation. Getting out of the bed to get on hands and knees so I could push. The only problem is I am absolutely terrible at pushing on hands and knees. So I just don’t. My body does it for me. After a couple more really strong contractions on my hands and knees, my water was REALLY bulging and Jessica asked if I wanted to feel it. I’d had high water volume the last part of the pregnancy and when my water broke it soaked the bed, the floor, it was everywhere. My husband refers to it as the great flood haha. Since I was delivering on hands and knees again, it meant my body was pushing for me since I can for some reason not figure out how to push in any position other than on my back. Not optimal for baby delivery. Awesome for not tearing. When the baby was crowning (between contractions no less) my midwife told me she needed me to push and I could hear a sense of urgency in her voice. Read above where I absolutely CANNOT figure out pushing in the hands and knees position. I told her I couldn’t, so during my next contraction she told me I needed to flip over onto my back. As I did, baby shifted and was born completely effortlessly at 6:34 am. Harbour Breckyn was born weighing exactly the same as her big brother Tinson – 7 lbs 7.5 oz. I can’t remember how she ended up in my arms. If I picked her up or if someone handed her to me, but she was completely peaceful and not crying at all. I’m almost positive it was our midwife Jessica (or it may have been the nurse in the room…at this point everything is a complete blur) that said we just need that baby to cry. I held her in a sitting up position and told her I needed her to cry for me while I was rubbing her back pretty vigorously. She started to cry a little but I wanted her to really belt out some good cries so we could make sure her air passageway was clear and that she hadn’t inhaled too much fluid during delivery. She started screaming and crying and I felt a poke on my shoulder. I looked up to see my husband petting my shoulder with his pointer finger and tearing up, trying not to cry. He just looks so loveable and perfect in those few seconds that are so hard to remember later. Delivery days are always a crazy blur of chaos and emotion…but I hold onto the memory of that face he has because there are zero pictures of it. My immediate thought after I delivered was thank God I’m not pregnant anymore. While most moms are probably crying with their babies as soon as they deliver them, I’ve never been that way. Immediately after having my babies, I’m all business. I want to make sure they’re okay, try to look them over and make a mental picture of the moment…I feel happiness but I’m not overwhelmed and crying like a normal person haha. I’m just watching the cues of the midwife and nurses in the room to make sure I don’t have anything to worry about. At my longest pregnancy – 39 weeks and 2 days, I was completely ready to be done with the pregnancy but not at all prepared for a TWO HOUR LABOR from start to finish. When we have baby number 4, I think we’ll camp out in the birth center parking lot the last few weeks just to make sure we make it in time. 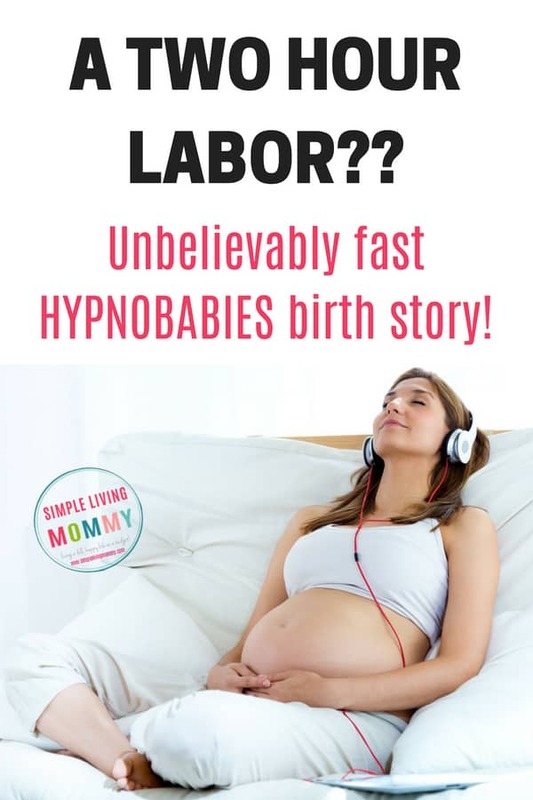 Even though I had such a whirlwind labor and delivery and didn’t get to a “hypnotic” state as a result, I would still highly recommend Hypnobabies for pain management techniques and to handle anxiety during pregnancy. It ABSOLUTELY helped with anxiety at the end of my pregnancy. When we have baby #4, I’ll be doing Hypnobabies again! Have you ever attempted a natural birth? How did it go? What birth class (if any) did you take? Let me know in the comments! I had a natural birth with my first and only so far! I wanted it from the beginning, and God made it happen just as perfectly as it could have. I also had a very fast (5 hour start to finish) labor, and hope to do it naturally again.